The last months of the previous year brought significant changes in the global sales strategy of dedicated solutions for the flexography industry manufactured by the Polish-based Lesko Engineering company. The equipment, which so far have been offered outside Poland under the Grafotronic brand name, is now available in all countries under the Lesko Engineering brand name. The company has announced expansion of its global sales network based on authorized dealers operating on particular markets. In Poland, its solutions have been offered so far both directly and through a trading partner – System P.
Leszek Seroczynski - owner of Lesko Engineering in the assembly hall of the company's headquarters. Lesko Engineering has more than 10 years of experience in printing industry. The company employs ca. 50 people in its headquarters situated near Warsaw. It manufactures – basing on its own ideas and designs – advanced solutions for flexography: printing presses, packaging machines (incl. sheet cutting machines, die cutting machines), slitter-rewinders and inspection systems. The company produces by itself approx. 95% of subassemblies and components used for final manufacturing and assembly. So far, it has sold around 500 machines worldwide; half of them have been purchased by international customers. Machinery commissioning, staff training and post-sales support are the responsibilities of a qualified service department at Lesko Engineering. “The machines we offer are custom-made solutions designed and manufactured for dedicated customers and specific applications”, says Leszek Seroczynski, the company’s owner. “We do not offer so called mass production. Each machine is built on a basis of the specification provided by a final customer, with his needs and expectations taken under consideration”. Within last 12 years, Lesko Engineering’s machines, offered under the Grafotronic brand name, have gained recognition amongst hundreds of customers from various parts of the world. 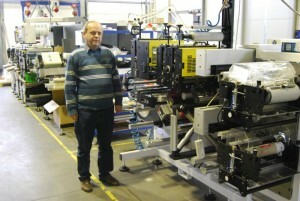 Many customers use more than one solution from this Polish-based company. Leszek Seroczynski stresses that except the sales conducted by the trading partner, the other activities related to the usage of equipment from Lesko Engineering were carried out by the manufacturer itself: “Nothing is going to change in this respect. All contracts with our present customers, as well as orders being already completed, remain in force. The only modification is change concerning commercial activities, which is strategically important from our point of view. So far, we have operated abroad in co-operation with a single, exclusive supplier, and the machinery from Lesko Engineering was known under Grafotronic brand name. From now on, however, we want to carry out global sales activities by ourselves. We are also looking for trading partners interested in possible co-operation. Therefore, the machines we manufacture will be sold under the Lesko Engineering brand name. We hope that our new strategy will bring numerous advantages to both present and future users of our solutions”. Apart from getting involved internationally in commercial activities, the company also plans to take part in several trade events targeted at flexography and label printing houses which base on narrow-web technology. “For many years we have been participating in both the European and American editions of the Labelexpo trade fair. This year will be similar, although this time we will participate in the Labelexpo Americas fair under our own brand name. As far as the domestic market is concerned, we won’t miss the most important conferences and seminars. We plan to take part, among others, in the seminar organizes by the Polish Flexographic Technical Association”, announces Leszek Seroczynski. Lesko Engineering has been developing successively, with annual sales increases of 10–15%, and introducing further innovative machines into the market (a modular Digital Converting Line made its debut during the recent Labelexpo Europe 2015 trade fair). Its solutions are also implemented – basing an OEM agreement – in the equipment offered by other manufacturers (e.g. Rietstack). The company has recently moved to a new headquarters near Warsaw, where it holds a manufacturing plant with an assembly hall and a department where most machinery subassemblies and components are fabricated. This is also where a brand new part of Lesko Engineering is to be established – a research & development center. “We have received a subsidy from the EU which will help us in a development of a printing press allowing for a production of so called printed electronics. It will include units based on various printing techniques: flexography, gravure, screen printing. We hope that this innovative solution will be our first step towards broadly defined industrial printing”, says Leszek Seroczynski.